Debuting in the revolutionary year of 1848 under the mysterious acronym “PRB,” the paintings showed a virtuoso demonstration of technical prowess in painting and bright colors patterned after the original “pre-Raphaelites” of the Early Renaissance. To borrow Erwin Panofsky’s description of the artists of the Northern Renaissance, the realism of the PRB was based upon a vision that was both “microscopic” and “macroscopic.” In other words, the artist saw through both a microscope and a telescope, perfect vision, both near and far: the world revealed in all its manifest detail. With the Pre-Raphaelites, the attention to detail was nothing short of obsessive. The labor-intensive painting practices were based upon a morality of work and diligent labor that gave their works an aura of the medieval, as was intended. Pre-Raphaelite art acted as a rebuke to the lazy habits of the academic artist who copied, not nature, but artistic conventions. The influential art writer, Lady Elizabeth Eastlake, called their academic practices “laborious idleness.” Although the PRB was rebellious against academic theories and practices, there were limits to the rebellion of these middle class men. The group resembled a boy’s club, for the men involved were quite young, and the women later associated with the PRB remained peripheral and played a larger role as models than as associates. At mid-century, young English artists were prepared for the Royal Academy in a system called the “schools,” or preparatory schools, such as Sass’s Academy and Heatherley’s School of Art. But the Discourses of Sir Joshua Reynolds seemed less relevant to new artists, as a newly restive lower class demanded a voice in government and newly rich industrialists began to collect art. After the Reform Bill of 1832, the climate of English art changed and the shift away from ancient times and Renaissance models and towards a new interest in the great social and economic changes taking place in Britain. A group of young artists, some graduates of the “schools,” initiated a modern realism in England at the same time Gustave Courbet was preparing for his bold move to political realism. In 1848, the artists of Pre-Raphaelite Brotherhood established a style and content that was so successful and so beloved that the “realism” of this group lasted as an English tradition well into the twentieth century. The movement was complicated, combining vestiges of Neoclassicism, with careful drawing and historical content, and Romanticism, with a fascination with the Medieval past, and Realism, with a new emphasis on urban subject matter. However when the Pre-Raphaelites announced their arrival on the art scene, the approach was deliberately anti-academic, anti-classical, and self-consciously historicist, that is, painted in an archaic style not seen since the early Renaissance. The first PRB painting was probably that of Dante Gabriele Rossetti, The Girlhood of the Virgin Mary (1848-49). The artist (and poet) did not sign his name but inscribed instead the mysterious letters “PRB” in red paint. The rebellion against the Royal Academy had arrived, not at the Academy itself but at the Free Exhibition Society in London in March 1849. A year later the mysterious group showed at the Royal Academy Exhibition of 1850. Art history has exorcised Pre-Raphaelites from the canon of correct art but the PRB was the first group to self-consciously declare themselves avant-garde artists. They issued a literary manifesto, published their own journal, The Germ, for four issues, opposed the kind of academic art that based upon Raphael, painted en plein air, and organized their own exhibitions three decades before the Impressionists. There were two main groups of artists associated with the PRB. The founding group, the “PRB,” was organized by Dante Gabriel Rossetti in 1848 and included John Millais, who entered the Royal Academy at the age of eleven, and William Holman Hunt. All members selected by Rossetti, this group included lesser known painters and writers, Michael Rossetti, James Collinson, Thomas Woolner, and Frederick George Stephens. Meeting for the first time in 1848 in the studio of Millais, the original group were inspired by the German Nazarene artists and determined that three elements were necessary for them to establish a new kind of art. First, they had to be a disciplined group, which, second, produced a distinct doctrine, disseminated, lastly, by their own journal. The idea of discipline and doctrine would have pleased Sir Joshua and the journal was designed to preempt the power of the art critics. However, the President would not have been pleased by the PRB’s refusal to take classical art as their model. Instead the Pre-Raphaelites rebuked the notion of “style” and formulas and looked to nature in a desire to retrieve a naïve vision. Clearly, in some aspects, the English idea of Realism was close to the French concept. Based upon science and a close study of nature, Realism in both nations sought to regain an innocent eye and to eliminate self-conscious style in favor of objective observation. Both the French and British Realists were part of a movement that was deliberately avant-garde and in rebellion against their respective academies. Both groups used realism, as approach and as content, to position their art to counter the stranglehold of the establishment. There were important divergences, however. Although the English were not directly impacted by the Revolution of 1848, the French were directly involved in this wave of discontent that raced across Europe. In Paris, the révolution de Février was brutally suppressed when the beleaguered inhabitants of the inner city rose up against the Orléans regime. The result of the Revolution in France was a bit of a mixed outcome: the monarchy was toppled and the Second Republic came into being, but the short lived Republic was rapidly pushed aside by a new Emperor Napoléon III. In contrast, to the political unrest disturbing the people of France, the Revolution was more of a diplomatic question in England. Long the most “liberal” nation in Europe, both politically and philosophically, England was able to slowly provide small concessions to the lower classes, enough, over time, to stave off serious problems. While the British watched their rival, France, caught up in yet another swirl of revolution, as long there was a stable government they could deal with, the English could have an idea of how to act. Therefore, the impact of the Revolution of 1848 in France was intensely political and pitted class against class, while in England, the year 1848 was not particularly significant. As a result of the continuous shrugged between the bourgeoisie and the proletariat, it would be more appropriate to say that the Realism of the French was a response to contemporary scenes of life in France, particularly life among the lower classes. On the other hand, the English Realists were more intent in precisely copying nature and losing themselves in the welter of details. 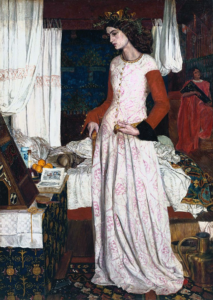 For them, Realism was linked to an absolute and moral fidelity to Nature and their content was simply “English.” The “Englishness” of English art could be found both in the past and present in the art of the Pre-Raphaelites who were inspired by English literature and poetry and by the social problems in an industrial society. In contrast, the second group of Realist artists in England could also be termed “artisans,” whose realism was to be found in their exactitude of execution. This second group used precision to evoke the past. Just as the first group of mid-century English artists were self-consciously archaic, so too did the second group also look back to Medieval art and its standard of excellence and pride in individual craft. This group, which formed around Rossetti and included the artist, Ford Maddox Brown, who was associated with the PRB but not part of the original group. Both the Pre-Raphaelite Brotherhood and the Oxford group were reacting to the changes to England that were taking place before their eyes. Just as a few decades later, the French artists would leave the city in search of unspoiled landscapes, these English artists set out in search of the “England” of the poets. Thus in addition to defining themselves against the major establishments in the arts, the PRB and the Oxford Group were also men of their time. By mid-century, England was rapidly becoming fully industrialized and factories were marching across once pristine countryside, spewing black smoke and darkening blue skies with soot. The rapidity of the change was unsettling to the nation which was bearing the brunt of the Industrial Revolution and it could be argued that poets and painters and writers rushed to save the “England” they had grown up with. England was not just a place but an idea that had been composed of legends and myths that dated back to pre-Roman times. This England was the England of Druids and fairies, knights in shining armor and magic swords. The artists who turned away from the modernity and its demands expressed their desire to preserve the past by an artistic gesture. The gesture or the philosophical stance of the PRB was to posit a literal return to the time before Renaissance “classicism,” before Raphael who created the grand manner. Along with the PRB, the Oxford group looked to the past, often being inspired by literature. The literary basis of English art at mid-century was another distinguishing difference from the French who were much more contemporary in their subject matter. The Oxford Group came together at Oxford as undergraduates, becoming what was termed a “set” calling itself the “Brotherhood.” This original “set” consisted of William Morris (1834-1896), Edward Burne-Jones (1833-1898), and William Fulford (1831-1882). The other founding members were Cormell Price (1835-1902), Richard Watson Dixon (1833-1900), Henry MacDonald, Charles Joseph Faulkner (1834-1892), who were later joined by Wilfred Heeley (1833-1876) from Cambridge. Probably inspired by the Pre-Raphaelite journal, The Germ, this organization published a magazine, The Oxford and Cambridge Magazine, which lasted the year of 1856. The gentlemen at Oxford were originally religiously inclined but they began reading, not the Bible, but Shakespeare to each other. Then they moved on to Tennyson’s “Idylls of the King” (1856 – 85) was an updating of Thomas Malory’s Morte d’Arthur (1470), which was discovered by the Group in 1855. Their magazine included excerpts from Malory’s Morte d’Arthur and sections of John Ruskin’s Stones of Venice. Like the German Romantics before them, these men looked to Gothic architecture for inspiration and traveled to Italy to see the early Renaissance murals. The only way, they surmised, to counter the pernicious influence of manufactured aesthetics was to become visual artists themselves. Together they painted murals of the life of King Arthur in the new building for the Oxford Debating Society. 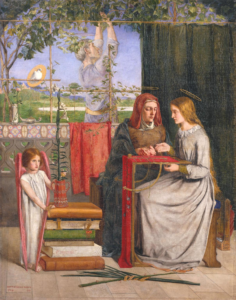 Both the Pre-Raphaelite Brotherhood and the Oxford Group had many followers and a long life span that dominated artistic and aesthetic life in England well into the Twentieth century. Sir Joshua Reynolds would not have been pleased to learn that the “English” style or “English school” of painting would never be established by chasing the classicism of the Italians or the English, in other words, “modeling,” but by a careful rendering of nature and a relentless observation of human behavior. The Pre-Raphaelites and their followers created “English” art precisely by defying Sir Joshua and his Discourses. After the Great War, the Pre-Raphaelite Brotherhood was eclipsed by modernism. One of the warning signs was the seminal exhibition at the Grafton Galleries mounted by Roger Fry in 1910. “Manet and the Post-Impressionists” introduced significant French artists to the London art audience, which had long ago lost the thread and did not realize that the empirical and formal practices of the English artist of fifty years earlier predated those celebrated in Fry’s exhibition. The Oxford Group had a longer and more streamlined legacy and it could be said that William Morris’s design reform movement began the Arts and Crafts Movement that merged effortlessly into the English version of Art Nouveau and its Liberty fabrics and designers, such as Archibald Knox and Charles Rennie Mackintosh.The seven men of the Oxford Group were, as founders of the Arts and Crafts Movement, the precursors of Art Nouveau in France. Both movements were dreams of restoring respect for hand-crafted goods to counter bad middle class taste. However beautiful and popular these styles were, both Arts and Crafts and Art Nouveau were to expensive and too elitist to be accessible to the middle class the movements were trying to reform. And yet, today, these avant-garde English styles are still living and still popular and still in use, having long since been assimilated into contemporary life.